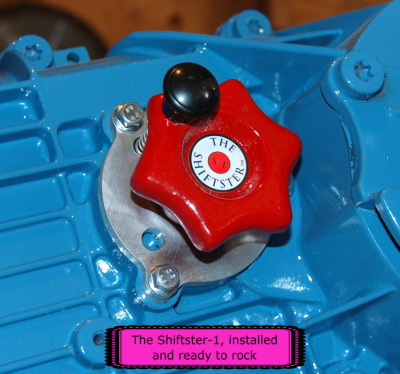 The Shiftster is a simple, rugged and bullet proof manual replacement for your trouble prone electric shift motor found on millions of Borg Warner transfer cases. These 1st Gen electronically shifted t-cases (often referred to as the ESOF or Electronic Shift On the Fly sysytems) first appeared in late 1986, and this style shift motor was used for almost twenty more years. They are commonly found on just about every Ford four wheel drive vehicle built between 1986 and 2003---their F Series pickups, the Big and Small Broncos, Explorers, Rangers, Expeditions and the Excursions. In addition they were also used on several GM vehicles, some Dodges, Mazdas and Mercedes SUV's. Outside of the U.S. they can also be found in large numbers (Great Britain for example) on the Korean made Ssang-Yong four wheel drives, and in India they were used on their own very cool looking Mahindra Armadas. All of these vehicles are different but they all share one common trait----the use of the electrically shifted, push button operated B/Warner transfer cases. And as thousands of people have found out at one time in their lives, when the electric shift compents finally give out and stop working, your day is pretty much ruined----not to mention your wallet, if you're truly stuck and need a tow home. But the Shiftster solves all of that by eliminating the electrical portion of the ESOF system.